Pallet racks are the best way to increase storage capacity within a warehouse. Applied Handling NW offers pallet racking products & systems that allow better access to a given product, greater product flow, and increased safety. Industries which rely on storing or moving large quantities of items benefit from warehouse layouts with a properly designed and built pallet rack system. Pallet racks allow for storage both vertically and along rows and bays, providing the proper amount of access your products require. They can also aid in the movement of product within a facility and are easily integrated with other pallet racks and other warehouse systems to provide greater productivity. 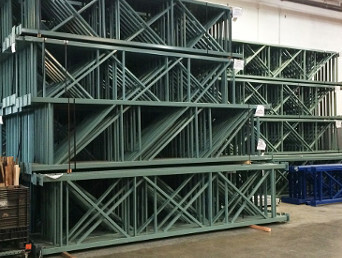 At our office in Portland, Oregon, we work with companies looking to install or expand their pallet racks. It is important to understand what your needs are before investing in these systems. Below you will find information on what to consider when looking into pallet racks and what pallet rack options you have to consider. This information will help you when discussing the proper pallet racking system for your facility. 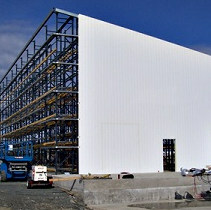 No two facilities are exactly the same, each company has different and unique needs to suit the product storage needs. In order to best understand your needs and potential solutions be sure you understand the following areas: selection versus depth, storage length, inventory control methods, and integration needs. Know that all of these areas usually have some overlap and many times they can be dependent on each other. The first thing you need to consider is product selection versus product depth. A wide selection of products requires different pallet racks than a small product variety with a deeper inventory. A wide product selection would work best with a selective pallet rack while a drive thru rack is better suited for deeper inventories of each product. You will also need to take into consideration storage length. Some product has an expiration date and requires short storage while other products can be stored for long lengths of time. Third, know what type of inventory control you will be using. The two main inventory controls are the first-in, first out method and the last-in, first-out method. Some pallet racking systems work only in one method. For example, flow racks only work in the first-in, first-out method. Lastly, know what type of integration maybe necessary. Pallet racks work nicely together and with outside systems like conveyor systems. 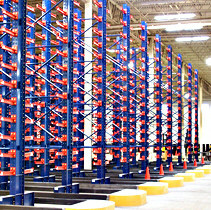 Selective pallet rack systems are the most commonly used systems in use. These racks are designed to allow for access to every pallet bay and are best used in a facility with large variety but low turnover. Selective systems require aisle access for forklifts required to restock bays. A selective racking system can be made of two materials, structural rolled steel for heavy-duty interactions and roll-formed construction for more flexibility. Push back pallet racks allow multiple pallet storage for one product. These systems work by using gravity, carts, and angled rails to feed the front of the system. A push back system can generally hold 2 to 6 pallets per lane and each lane acts independently from other lanes. This allows for selectivity with the ability to store more pallets of a single product. However, this requires the warehouse use a last-in, first-out system. 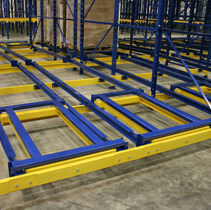 Pallet flow systems, also known as gravity flow racks, use gravity to move pallets into the front position. Pallets are loaded into the system from one aisle and fed to an unloading area. As a pallet is removed from the front of the rack any pallets behind will roll down to fill the front position. 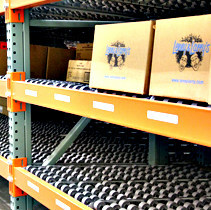 A pallet flow rack is used in a first-in, first out system and allow for more storage of one product. These two systems are similar, both allowing forklift access within the pallet rack itself. Forklifts load and retrieve products from support rails. In a drive-in racking system, there is only one entrance and exit per lane. A drive thru system allows for access on both side of the lane. Either system is used for high-capacity storage of a single product as each pallet position is dependent on other pallets in the lane. Carton flow rack systems are great to use for case- and piece-picking needs. These are gravity feed systems, transporting product from the loading side to the retrieval side through a series of wheels. There are two types of carton flow systems, one uses roller lanes and the other uses wheel beds to transport a load. These systems are versatile and have the ability to be customized to needs. Cantilever rack systems are useful for storing long items which do not fit traditional pallet racks. These racks are different from others as they are made of tall columns with adjustable arms. This allows storage of long or awkwardly shaped products with easy access. As these systems do not have vertical supports, they have the ability to store items with a variety of lengths, shape, and weight. 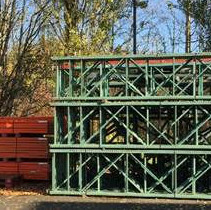 While providing the same advantages of traditional pallet racks, a rack supported structure also serves as support for their surrounding building. Once the racking systems are built they are then covered to protect its contents. Combining the rack installation and the building of the structure saves time and money for a project of this type. A system like this is a great way to create the ideal storage facility. Pick modules are the most efficient system to use in high-volume case picking and small parts distribution. These combine many features of storage, product handling, and shipping needs to move products throughout a facility. 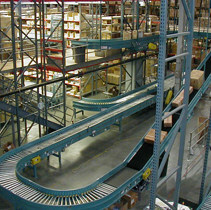 A pick modules system utilizes pallet racks, case flow racks, and conveyor systems and each individual system can a variety of options. A pick module is completely custom designed to fit each project and its needs. 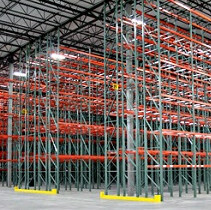 Looking to buy or sell used pallet racking systems? Depending on needs, used pallet racks are able to be safely installed for numerous projects. 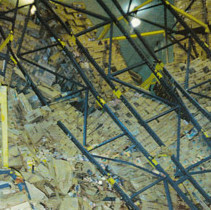 Applied Handling NW makes sure to carefully examine all used pallet racks to ensure their safety. Each storage facility is different and our used inventory can change, we may have the exact match for your warehouse or we may offer the best solution for your facility based on our current inventory. In addition to pallet rack systems, we also offer a wide range of repair, safety, and accessory options. All systems are unique and depending on their use may require different accessories to increase their effectiveness. Also wear and tear on pallet racks requires inspection and repair, if needed. The best pallet racking systems increase safety of workers and products; however, it is important to utilize every safety measure for the best results. 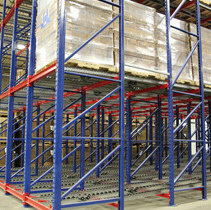 Pallet racking systems are varied but all provide solutions to your product handling needs. Whether looking for high selectivity or high-volume product storage, pallet racks can immediately impact product movement and storage and increase safety on the warehouse floor. Pallet racks make it easy to combine all the necessary styles to serve your company. Find out how we can help you maximize your storage and product handling capacity, all while saving you time, energy, and money. 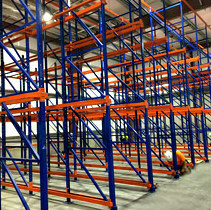 We offer a great selection of new and used pallet racking systems to meet the needs of your particular company. From traditional pallet racks to complex pick modules systems to pallet rack accessories, we match the right pallet racking to your particular inventory requirements. 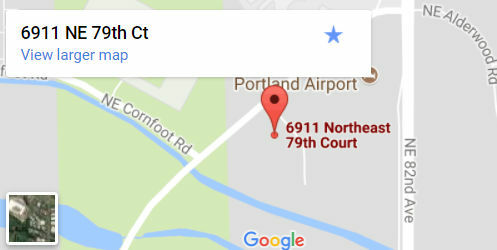 For all of your pallet racking needs in and around Portland, OR, please contact us today to speak to a member of the Applied team.